SCOB - Science Centre OBservatory: January 2013 - Happy New Perihelion! January 2013 - Happy New Perihelion! Our first stargazing session of the new year turned out to be very cloudy indeed, not a single thing to see. The same was also true during our attempts to see ISS fly over Singapore on 2nd & 3rd Jan. However, as the weather is much clearer and hotter this week, I put a solar filter on our 6-inch refractor attached to the main telescope and took a look at our parent star, the Sun. 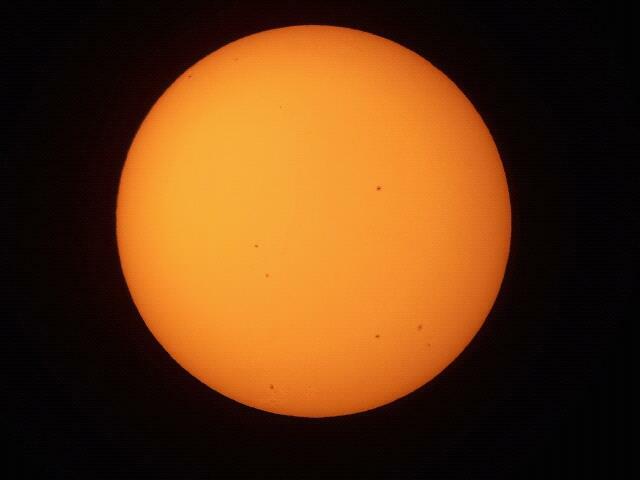 Photo of Sun ans sunspot 7th Jan 2013 4:15pm - taken through 6 inch refractor with Samsung SII phone camera. Image is rotated 90deg counter-clockwise, north is on the left, south on the right. Image of the Sun from NASA satellite SDO (Solar Dynamic Observatory) showing the numbers/names of the sunspots on 6th Jan. The highlight area produce a M-class Solar flare on 5th Jan. This image is in the correct orientation with north at the top. January is the month when the Earth reaches its closest position to the Sun, (perihelion), which was actually on 2nd Jan. The difference between Earth's perihelion (closest) and aphelion (furthest) distance is only 3% so it doesn't look any different than usual. 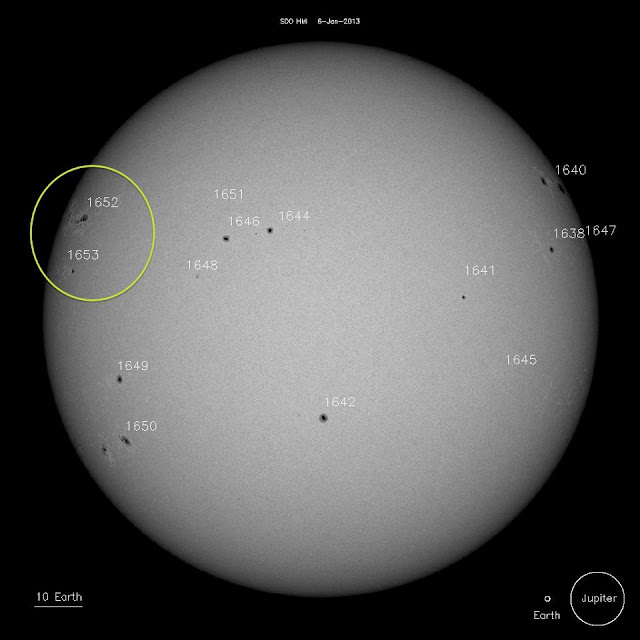 There were several sunspots visible on the Sun's surface, areas of magnetic instability and high activity, usually associated with solar flares. 2013 is expected to be the year in which the Sun reaches its solar maximum, the peak of its 11 year natural activity cycle. Most of the brightest stars in the sky are visible during the first part of the year. 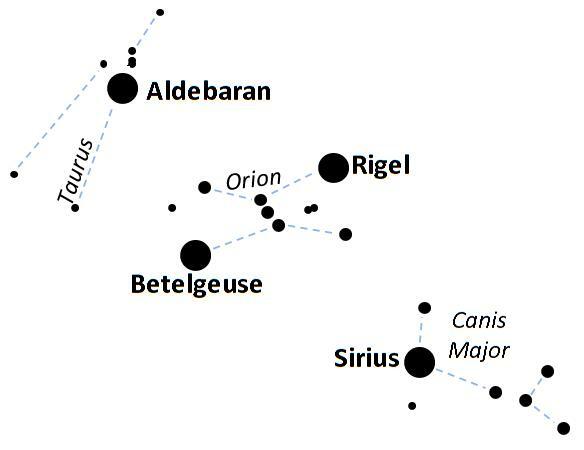 This includes Orion, Taurus and Canis Major, with the brightest star in the night sky Sirius, lower towards the south-east. We've been observing Jupiter for over a month now and its still shining brighter than all the stars. This month its alot higher in the sky, so we should get some nice clear views of its bands of clouds and its 4 Galilean Moons. 64 moons have been discovered around Jupiter, but only its four biggest moons, Io, Europa Ganymede and Callisto are visible through most telescopes. 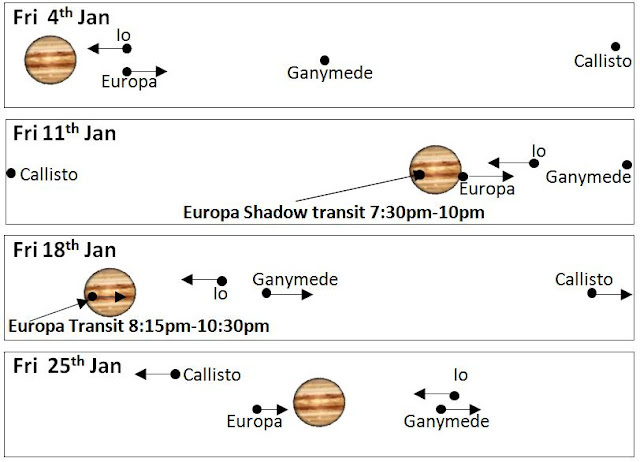 Position of Jupiter's four biggest moons during Friday night stargazing at SCOB (8pm-10pm). 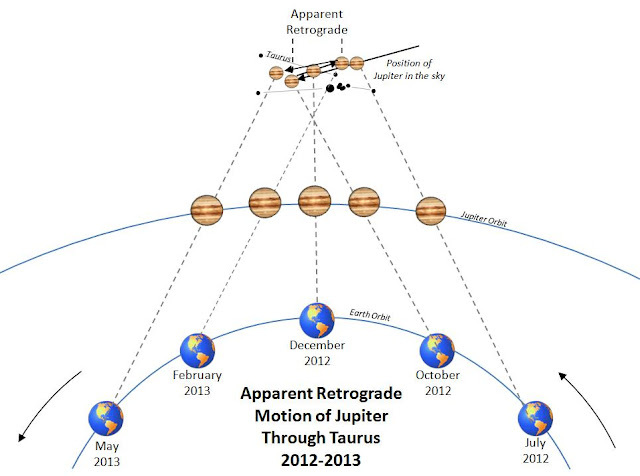 This apparent retrograde is due to the position of the Earth. As Earth is closer to the Sun, it travels faster than Jupiter. Both planets are travelling in the same direction but as Earth comes closer to Jupiter and eventually overtakes it, the giant planet appears to move backwards. This current retrograde will last from Oct 2012 until 30th January 2013. The Moon moves close to Jupiter on 21st Jan and 22nd Jan. Look out for the bright planet next to the Gibbous moon on these two evenings. On Friday nights at SCOB, we'll be observing the Moon on 18th Jan (crescent/half moon) and 25th Jan (gibbous moon).